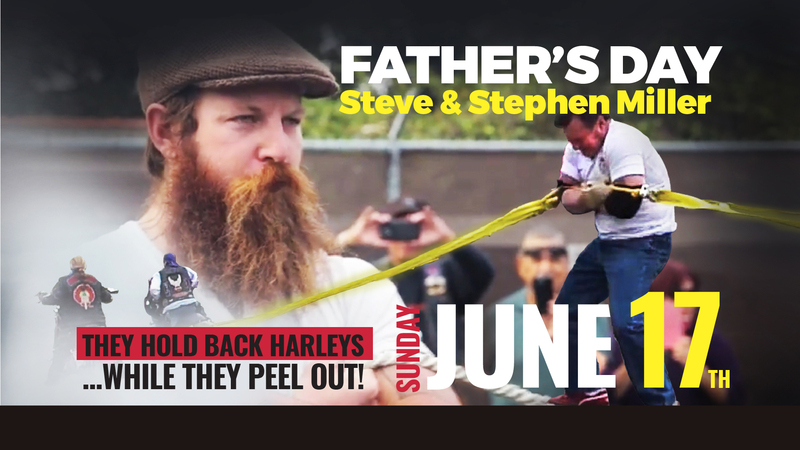 This Father’s Day, June 17th, Strongman Stephen Miller will attempt to set the Guinness World Record for “The Human Platform,” by lying on a bed of nails and enduring the weight of 50 men as they walk over him at 11am sharp at The Life Christian Church. This Father’s Day, June 17th, Strongman Stephen Miller will attempt to set the Guinness World Record for “The Human Platform,” by lying on a bed of nails and enduring the weight of 50 men as they walk over him at 11am sharp at The Life Christian Church. He will be joined by his father, world-renowned Strongman Steve Miller. Together, the father-son duo will perform amazing feats of strength, before delivering an empowering message for men and the women who love them. During both the 9am and 11am services, the Millers will compete against two former NFL linemen – NY Jets’ three-time Pro Bowler, D'Brickashaw Ferguson, and Buccaneers' Super Bowl XXXVII Champion & NY Giants’, Roman Oben. Steve Miller will use one arm to compete in a tug-of-war match against Ferguson and Oben at the same time. The NFL linemen will then join forces with four other men, in an effort to pull apart the folded arms of Stephen Miller. Steve Miller is a five-time world record holder for feats of strength. He has held back four Harley Davidson Motorcycles while they peel out and has appeared on “Ripley's Believe It or Not!” where he held up a bungie jumper with his bare hands. He holds 4th degree black belts in three different disciplines of Martial Arts and is a decorated Mixed Martial Arts champion. Both Steve and Steven have traveled all over the world mentoring and training others to build lasting legacies. This Father’s Day event at The Life Christian Church includes fun for the entire family. Following both the 9am and 11am services, spectators can enjoy a Food Truck Rally featuring a variety of food trucks, a live DJ and a Photo Booth opportunity. Follow @TheLifeChristianChurch on Facebook and Instagram. World Record Setting Father's Day Event Featuring Strongmen As Seen On "Ripley's Believe It or Not! "Strongman Stephen Miller will attempt to set the Guinness World Record for “The Human Platform,” by lying on a bed of nails and enduring the weight of 50 men as they walk over him at 11am sharp at The Life Christian Church on Sunday, June 17, 2018. World Record Setting Father's Day Event Featuring Strongmen as seen on "Ripley's Believe It or Not! "Strongmen Steve Miller & Stephen Miller will compete against two former NFL linemen – NY Jets’ three-time Pro Bowler, D'Brickashaw Ferguson, and NY Giants’ Super-Bowl XXXVII Champion, Roman Oben. Stephen Miller will attempt to set a World Record. The Life Christian ChurchAll are welcome at The Life Christian Church at 747 Northfield Avenue, West Orange/Livingston Border, NJ.